One of the most significant events of our times is the rebirth of the State of Israel. Many believe this historic event to be a fulfillment of Bible prophecy. Others consider it nothing more than a passing political coincidence of world history. Whatever your view, we cannot ignore the events taking place in the Middle East regarding the Arab- Israeli conflict. Christians want a solution to the difficulties based on justice and compassion. Yet, the solution must be founded on truth. How can we know the truth among conflicting claims? Whose land is it? What about Jerusalem and Christian holy sites? Are their voices to guide us? How should Christians respond? Dr. Richard Booker, best-selling author and Christian minister, answers these and many other questions about the relationship between Christians and Israel as it relates to the current crisis between Israel and her Arab neighbors. 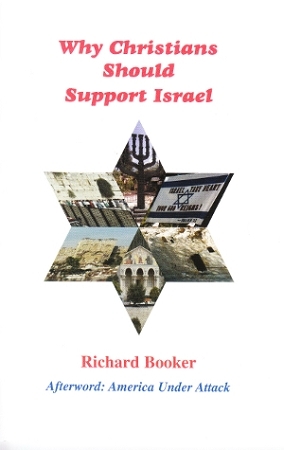 In "Why Christians Should Support Israel" Dr. Booker explains the biblical, historical, political, humanitarian, moral, economic and religious claims to the Land of Israel and Jerusalem. He clarifies the issues for Christians in a clear and concise manner. This book is filled with interesting photos.